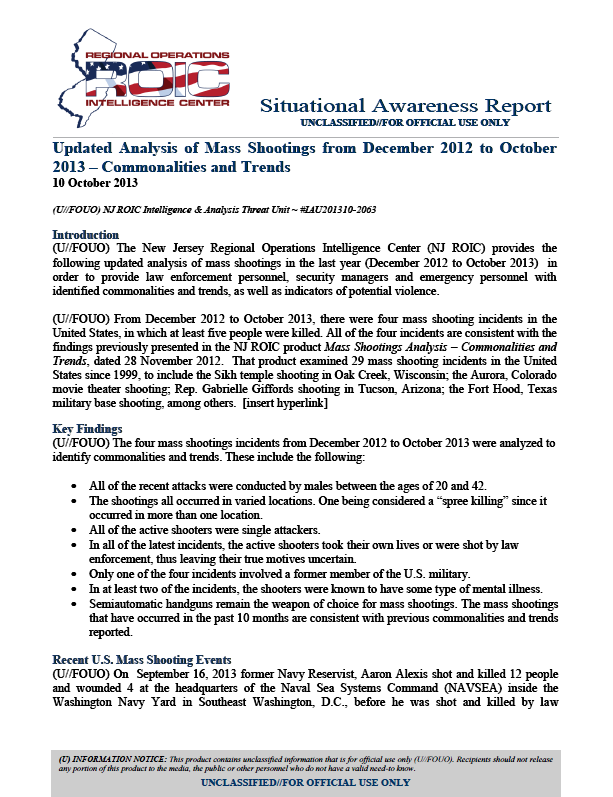 (U//FOUO) The New Jersey Regional Operations Intelligence Center (NJ ROIC) provides the following updated analysis of mass shootings in the last year (December 2012 to October 2013) in order to provide law enforcement personnel, security managers and emergency personnel with identified commonalities and trends, as well as indicators of potential violence. (U//FOUO) From December 2012 to October 2013, there were four mass shooting incidents in the United States, in which at least five people were killed. All of the four incidents are consistent with the findings previously presented in the NJ ROIC product Mass Shootings Analysis – Commonalities and Trends, dated 28 November 2012. That product examined 29 mass shooting incidents in the United States since 1999, to include the Sikh temple shooting in Oak Creek, Wisconsin; the Aurora, Colorado movie theater shooting; Rep. Gabrielle Giffords shooting in Tucson, Arizona; the Fort Hood, Texas military base shooting, among others. All of the recent attacks were conducted by males between the ages of 20 and 42. 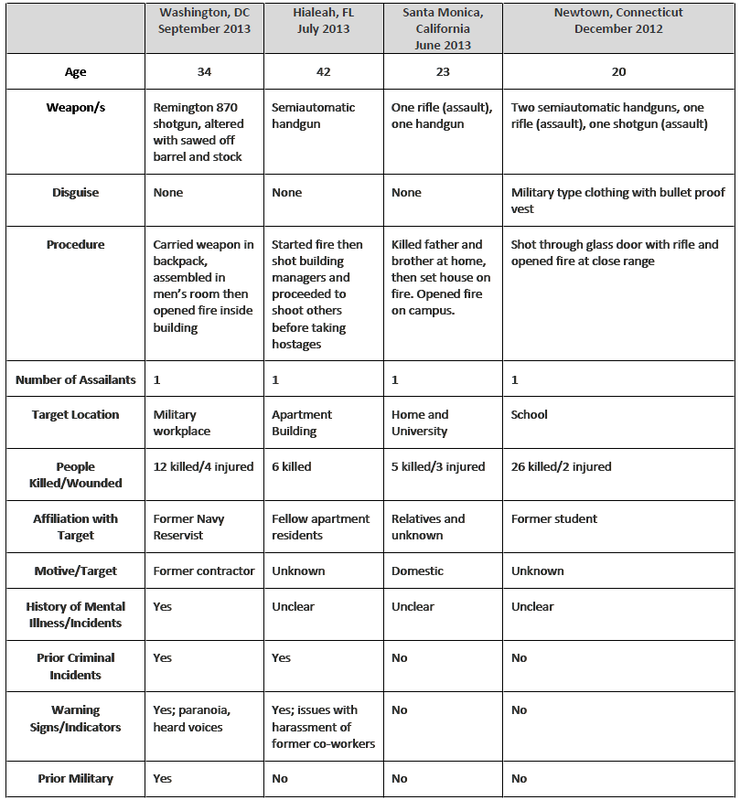 The shootings all occurred in varied locations. One being considered a “spree killing” since it occurred in more than one location. All of the active shooters were single attackers. In all of the latest incidents, the active shooters took their own lives or were shot by law enforcement, thus leaving their true motives uncertain. Only one of the four incidents involved a former member of the U.S. military. In at least two of the incidents, the shooters were known to have some type of mental illness. Semiautomatic handguns remain the weapon of choice for mass shootings. The mass shootings that have occurred in the past 10 months are consistent with previous commonalities and trends reported. (U//FOUO) On September 16, 2013 former Navy Reservist, Aaron Alexis shot and killed 12 people and wounded 4 at the headquarters of the Naval Sea Systems Command (NAVSEA) inside the Washington Navy Yard in Southeast Washington, D.C., before he was shot and killed by law enforcement. The Washington Navy Yard Shooting is considered one of the deadliest military installation shootings since the November 2009 Fort Hood shooting. (U//FOUO) Alexis was an information technology employee with a defense company, who used a valid identification to gain access into the Washington Navy Yard. Alexis used a Remington 870 shotgun during his shooting spree, which he purchased at the Sharpshooters Small Arms Range in Virginia. Alexis inquired about purchasing a handgun, but was denied because the federal law prohibits the sale of handgun directly to non-state residence. The Remington 870 shotgun had been altered with a sawed-off barrel and stock. Purple duct tape covered the end of the stock and handwritten etchings were present on various parts of the shotgun. (U//FOUO) The term ELF is believed to mean ‘Extremely Low Frequency,” and can refer to weather or communication efforts. The investigation showed multiple indicators that he had delusions that he was being controlled by extremely-low-frequency (ELF) electromagnetic waves. Investigators believe that the etching of “My ELF weapon!” on the receiver of the shotgun is a reference to these waves. In one of the documents found on his electronic devices, Alexis wrote: “An ultra low frequency attack is what I’ve been subjected to for the last three months, and to be perfectly honest, that is what has driven me to this.” The FBI says that the Navy has legitimately used ELF technology, but that there are conspiracy theories regarding the use of ELF waves in government mind-control and manipulation programs.